I was stuck at home today, and just before leaving to walk out in the rain for a long, cold, wet trek to get some lunch, I decided to poke around and see what we had on hand. 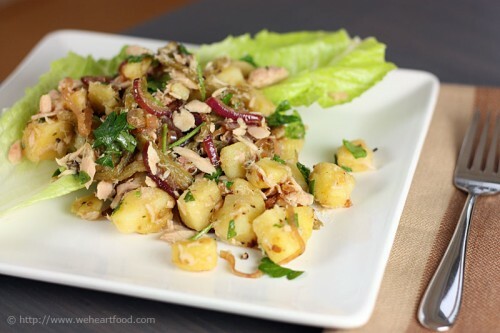 I knew we still had a few potatoes left from the CSA box, and when I spotted a can of tuna, something clicked in my mind and I remembered a recipe from Mexican Everyday by Rick Bayless that I had been wanting to try. The version in the book uses poblanos, but I knew the roasted hatch chilies sitting in my freezer would work just as well, if not better. The onions and shallots kept a lot of their crunch, and along with the chilies provided a nice contrast in texture to the soft potatoes. The tuna adds protein, but doesn’t overpower the other flavors in the dish. Hooray for having ingredients on hand — this potato salad kept me sated — and dry! [1:36 PM] Chris: Guess what I had for lunch? [1:41 PM] Chris: We had tuna, potatoes, shallots, and the hatch chilies in the freezer… I made that potato salad w/tuna from the Rick Bayless book! [1:41 PM] Lisa: Are there leftovers??? [1:41 PM] Lisa: I want to try it!!! [1:41 PM] Chris: Uh, no. Didn’t make a full recipe, sucka. Fascinating, I know! Hey, I do what I can. Put the cubed potatoes into a microwave-safe bowl and sprinkle with 1/2 tsp of salt. Cover with plastic wrap and microwave on high for about 3 minutes, until completely tender. Leave covered. Rub the blackened skin off the chilies and pull out the stems and seeds. Rinse to remove rogue seeds and skin, then cut into 1/4″ thick strips. Heat the oil in a large skillet over medium-high heat. Add the onion and shallots and cook, stirring frequently, until the onion and shallots are browned, about 4 minutes. Remove from the heat and stir in the vinegar, oregano, black pepper, and hatch chilies. Stir well, then add the potatoes to the pan. 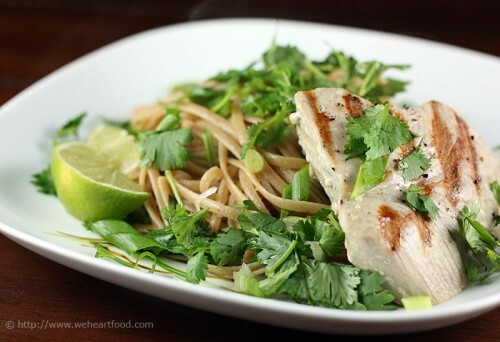 Set aside to cool; when at room temperature, add the parsley/cilantro and tuna. Serve over optional Romaine lettuce leaf. Tonight’s meal comes from Fitness Food (hey Carrie, try this one!) 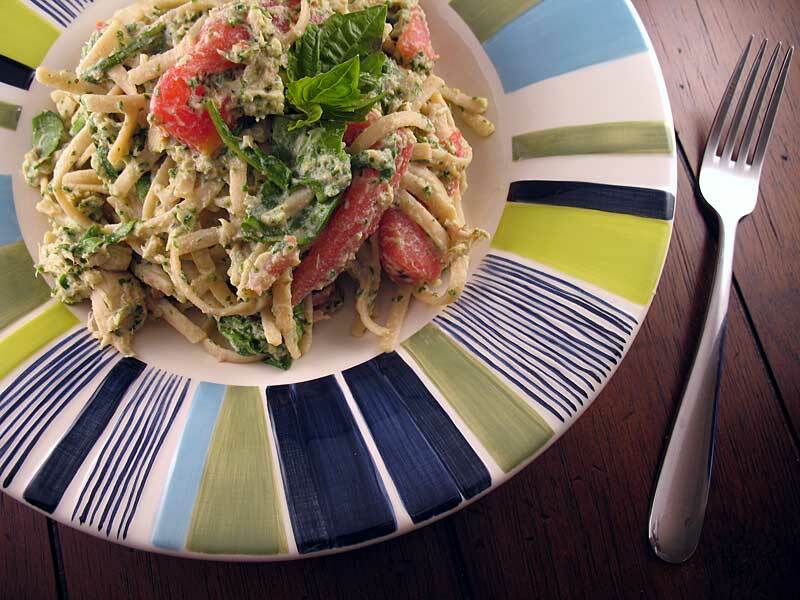 — whole wheat pasta is tossed in a creamy sauce made with ricotta cheese, arugula, and basil, and tossed with tomatoes and tuna. This was a very quick meal to make. I like the sauce, it’s almost like a pesto. Totally — though she’d certainly add peas. Anyway, enough about her! I like the arugula. So it’s in the sauce, and then some extra is just tossed with the pasta? Yep — it gets all wilty and intense. Good stuff. Cook the pasta in a large saucepan of boiling water for 10 minutes or until tender. Drain, reserving 1/2 cup of the pasta water. Return the pasta to the pan and toss in the tomatoes. Stir to combine. Heat the oil in a pan over medium-high heat, add the garlic and chili pepper and cook for 1-2 minutes. Add three-fourths of the arugula leaves and cook for about a minute until it wilts. Remove from the heat and add everything in the pan into a food processor, along with the basil and ricotta. Process until well combined, adding enough of the reserved pasta water to thin a bit. Toss the ricotta sauce and the remainder of the arugula leaves through the pasta and tomatoes. Break up the tuna with a fork and toss through the pasta as well. Garnish with additional basil, if desired, and serve. This seems to be an ideal post for this week’s Presto Pasta Nights! Tonight we made a recipe based on one found in the Mushroom Lover’s Mushroom Cookbook. 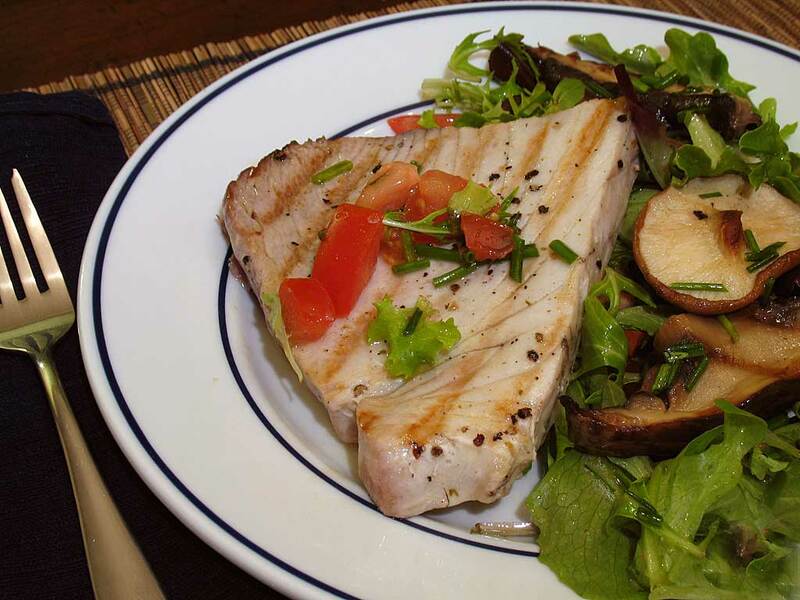 Tuna that’s been brushed with a truffle oil marinade is cooked to medium-well and served over a salad with grilled portobello and shiitake mushrooms. A little goes a long way with that truffle oil; that really adds a lot of flavor. Yeah, you can totally taste it. This dinner rules — I like it better than the other grilled tuna salad we had. Totally. Of course, that could be because I’m making little sandwiches out of it with this awesome herb baguette. In a small bowl, whisk together the olive oil, truffle oil, and lemon juice until well blended. Add salt and pepper to taste, measure off 1/3 cup of the dressing, and reserve the rest. Rinse and pat dry the tuna, then sprinkle both sides with salt and ground pepper. Brush the tuna and mushrooms on both sides with the 1/3 cup of dressing and let rest at room temperature for 30 minutes. Preheat a grill to hot, or heat a grill-pan over medium heat for 10 minutes. Grill the mushroom slices for about 3 minutes on each side, then set aside. Grill the fish until medium-rare, about 2 1/2 minutes on each side. Toss the greens, grilled mushrooms, chives, and tomato in a bowl. Add as much of the reserved dressing to the salad as you would like. Divide the salad between two plates, and top each with a tuna steak. Tonight we tried out a main dish salad from Mexican Everyday by Rick Bayless. A bed of romaine is topped with a chayote slaw tossed in a guajillo chile dressing and seared tuna. A lot of different textures and flavors going on with this salad! I really love this guajillo chile dressing — it’s the same one we used on the heirloom tomato salad, but I used champagne vinegar this time. It’s great, I love it. The flavors go really well together. Although when I first saw it I thought I’d be starving later. Yeah, sorry, it doesn’t conform to our usual volume of food. So are you starving? Not STARVING… but I’m just a little hungry. Pour the oil into a large skillet and set to medium heat. When the oil is warm, add the chiles and the garlic. Turn and stir continually until the insides of the chiles have lightened in color and they are toasty smelling — 30 seconds or so. Remove from the heat. Transfer the chiles to a blender (leave the oil and garlic in the pan), add the vinegar and a teaspoon of salt. Blend for 30 seconds. When the oil and garlic are cool, add to the blender (set the skillet aside without washing) and puree until smooth. Taste and season with more salt if desired. Pour into a jar and secure the lid. Return the skillet to medium-high to high heat. Sprinkle both sides of the fish with salt. When the oil-filmed skillet is really hot, lay the tuna in the pan. When brown, no more than 1 minute, flip and sear the other side. Remove the skillet from the heat. Thoroughly shake the dressing, then carefully drizzle on about 3 tablespoons dressing. Turn the tuna in the dressing from time to time as it cools. Cut the chayotes in half lengthwise and remove the pits. Shred the chayotes through the coarse side of a grater. Scoop into a bowl and toss with 3 tablespoons dressing. Taste and season with salt. Divide the greens among four plates, forming them into wide nests. Top each with a portion of the chayote slaw. 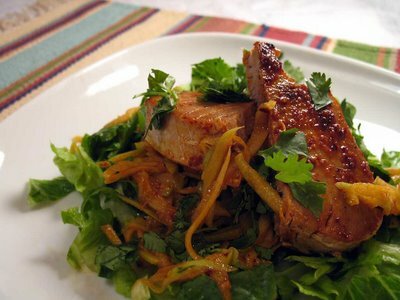 Slice each piece of tuna in half crosswise on a bias and place in the center of the salad. Sprinkle with cilantro. Considering this is the first time we’ve used chayote, and the recipe includes our favorite herb (cilantro), I’m going to submit this as our entry for the Weekend Herb Blogging Two Year Anniversary!